There are 3 meeting spaces, The boardroom for 12 people. The Ashmore room for 48 people. The Biltmore room for 90 people. You are allowed to bring your own catering/ *alcoholic beverages* with a signed contract. Set-up of tables and chairs is included. Tables cloths available at request. signed contract and deposit are required. The meeting spaces rates are either 5 hours or all day. No earlier than 7am and ending by 11pm. Clean up is provided as long as its not excessive. Anything of excessive trash or damage may result in additional fees. Atmosphere/Decor: good for baby showers, dinner rehearsals or business meetings. Special Features: There is a full size refrigerator and microwave. Atmosphere/Decor: Good for graduations, weddings, conferences, tradeshows, dinners. Special Features: Has a bar/kitchen area with 2 stove top burners, full fridge, microwave, sink and dishwasher. Also has separate men's and women's restrooms inside of space. Round or rectangle tables avail. 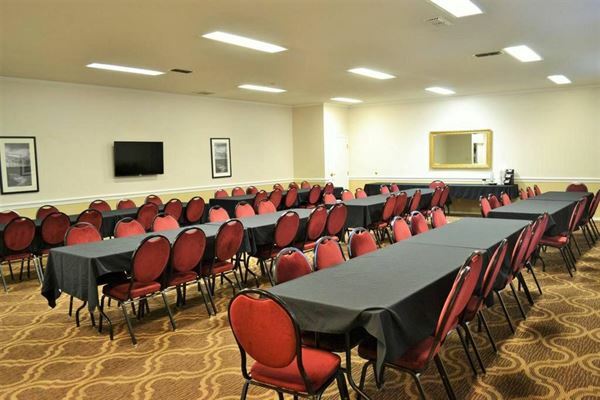 Also a dance floor is available in this room at additional fees. Atmosphere/Decor: Seating for 12 confernce style available. Special Features: Outdoor pool, inside jacuzzi. Complimentary full hot and cold breakfast. Complimentary bar 530-7pm beer,wells,wine,sodas and snacks.